An excellent of the foundation and development of the Labour Party and how it has acted in power and in opposition, effectively countering many of the claims for Labour having once been a working class, socialist party. First published in the early 1990s. Britain was the first capitalist society. From the earliest days of capitalism there has been a fierce struggle between the bosses and the workers. At times this struggle was industrial, with workers trying to set up types of unions (the first we know of was in the middle of the 17th century), at times it was political, with workers struggling for ‘democratic rights’, at times direct action was used, with workers destroying machines, blowing up factories and burning hayricks. Until the 1850s the responses of the ruling class was always the same. Brutal repression was the order of the day. Workers were sacked, imprisoned, hanged and deported. The 1850s saw the first ever successful setting up of Trade Unions. These weren't mass organisations of all workers. They were small tightly organised associations of skilled workers. Craftsmen in the building trades and skilled engineers were the first to get organised. These men were quite highly paid and saw themselves as a cut above their fellow workers. Some might call them an aristocracy of labour. They saw themselves as being respectable members of society who wanted nothing to do with notions of revolution. It was this social group that was rewarded with the vote in 1867. Essentially, capitalism realised it had nothing to fear from them. In the 1880s the first socialist organisation in Britain was formed. This was the Democratic Federation, which was soon renamed the Social Democratic Federation. This group was never very large and failed to attract much support from the ‘new’ unions. It wasn't until the 1890s that significant groups of workers began to look for independent labour representation. In 1893, the Independent Labour Party (ILP) was set up in Bradford. Its title explained its reason for existence. It still failed to gain much support from the existing unions. However, members of both the SDF and ILP did get themselves elected into important positions in the unions and Trades Councils. The 1880s and 1890s were like the 1980s and 1990s in one way. They both saw the coming of a great economic crisis. That of the 1880s and 1890s was called the Great Depression . Faced with falling profits and declining markets, the ruling class hit back against the working class. Many were sacked, others were forced to leave their unions. The overall effect was catastrophic for the Trades Unions. This was made even worse by a series of court cases which threatened the finances of the unions. The crunch came with the Taff Vale case (in 1901) which said that employers could sue unions for the effects of a strike. It was these court cases that persuaded the unions that they needed to get their act together politically. Faced with financial ruin, the TUC agreed to the setting up of a Labour Representation Committee in 1900. Its aim was to get independent labour MPs elected who would change the law in the unions interests. The LRC was a coalition of unions and socialist societies - the biggest of which were the ILP and the SDF. The SDF soon left when the LRC refused to adopt the politics of class struggle. After the election of 1906 and the winning of 29 seats by the LRC, it changed its name to the Labour Party. It wasn't socialist theory which had created the party, it was the action of a group of hard headed union leaders who realised that only by winning seats in parliament could they hope to alter the legal balance against themselves. This set the tone for the party and ensured that points of principle always had to give way to expediency and horse-trading. Even to get elected these MPs had had to do deals. In those days many constituencies had two MPs. Ten of the MPs were elected in these, where the Liberal party only put up one candidate. Sixteen of the others didn't have to put up with Liberal opposition. Only three of them had to fight for their seats against more than just a Tory. Most claimed to be devoutly religious, usually Methodist or Congregationalist, only a couple claimed to be Marxists. So the first group of Labour MPs were elected on the coat-tails of the Liberal party as a result of electoral deals and pacts. Small wonder that there was little difference between the two groups. For revolutionaries and socialists it is a simple principle that we oppose capitalist wars. They are always fought in capitalist interests, whether to capture new markets, to defend trade routes or to grab sources of raw materials. They are always said to be for ‘freedom’, ‘democracy’ or to defend the ‘rights’ of small nations. These justifications are equally always lies. These lies are used to con workers into joining up and dying while the boss class rakes in the profits. At times it can be difficult to see this. But in 1914 the issues were quite clear. Socialists in 1914 recognised this in Britain and in other countries. Almost without exception, the social democratic and labour parties rushed to support their ruling class against workers in other countries. This act clearly marked these parties as being on the side of the bosses and against workers all over the world. The grateful capitalist class were quick to reward the Labour leaders. In May 1915, the Liberal Prime Minister, Asquith, decided that to run the war properly he needed a coalition government. Arthur Henderson , the leader of the Labour Party, joined the cabinet and two other Labour MPs got junior jobs. In return, they collaborated with the introduction of conscription and the deskilling of industry. As the war went on Labour's membership of the government increased. This involvement in government was at a time of rising class struggle. As prices soared, food became scarce and wages failed to rise. There was an upsurge in class struggle, particularly on Clydeside. Many socialists were imprisoned for refusing to join up, speakers were beaten up and public meetings had to be cancelled. Labour's response was to fight to ‘Win the War’, to break strikes and try to exclude from the party the influence of groups like the ILP which tended to take a more pacifist line. In 1917 their influence was broken forever by the power of the trade union bureaucrats with the introduction of the union bloc vote. It was in 1918 that the party adopted what it claims to be a ‘socialist’ constitution. This was adopted under the influence of the Russian Revolution and the upsurge of struggle that followed it all over Europe. In theory it proposed very radical sounding policies, in reality it enshrined the unions bureaucrats control of the party. The constitution for the first time allowed individual membership of the party, thus it let in all sorts of guilt ridden, privileged, public school types who hoped to run a reformed capitalism. In fact it was written by one of them, Sidney Webb. This doesn't sound too bad on paper. Now we have something to judge them against, instead of just a desire to save union funds from the courts. They soon had a chance to put their ideas into practice. In December 1923 there was a General Election. Although the Conservatives won most seats they were in a minority. Labour and the Liberals massively outnumbered them. As the second largest party, Labour got the chance to govern. This first Labour government, led by Ramsay MacDonald, only lasted from January to November, before being replaced by the Tories again. They claimed that they were ‘in office but not in power’ and so couldn't really be blamed for not having done much. In February 1924 the dockers called a strike. This was opposed by the Labour government. In March the tramway workers in London came out. The railway unions proposed to come out in sympathy. MacDonald's response was to use the full force of the law on the side of the bosses. He invoked the 1920 Emergency Powers Act, this would have meant the declaration of a state of emergency if the strike had not been called off. In August the Attorney General tried to prosecute J R Campbell, the editor of the 'Communist' Workers Weekly , on a charge of incitement to mutiny. These actions all helped set the tone for the future. Other notable Labour victories of this government were to go ahead with rearmament, including the building of five new cruisers, the bombing of indigenous people in Iraq and shooting strikers in India - presumably for ‘mucking about with the British Empire’. Just six years after adopting its so-called socialist constitution, Labour had had a chance at government. It had acted like any other capitalist party - for the bosses and against the workers. Labour got elected again in 1929. Again it was a minority government. It promised to reduce unemployment, which stood at 1,164,000. Within a year it had gone up by 750,000 to 1,911,000. In two years it had more than doubled - reaching the then record level of 2,707,000. Faced with drain of gold from London in 1931 the government discussed ways to ‘Save the Pound’. What this meant was cuts in civil service pay and unemployment benefits. The Cabinet split over this and MacDonald, the ILP member, formed a coalition with Liberals and Tories to force the measures through. The majority of the party went into opposition. In the two years Labour had been in power, 4 million workers had had their wages reduced, including the Government's own employees. What followed was a period in the wilderness with continued Tory government. The party came under the leadership and control of two men - Clement Attlee and Sir Stafford Cripps. Both were members of the ruling class. Attlee was the son of a solicitor who had gone to public school. During the First World War, this famous socialist and ILP member had been a Major in the army. He had tried to enlist just two days after the war started, but had been refused because he was too old. Undaunted he kept on trying and had on a number of occasions considered shooting men for cowardice. 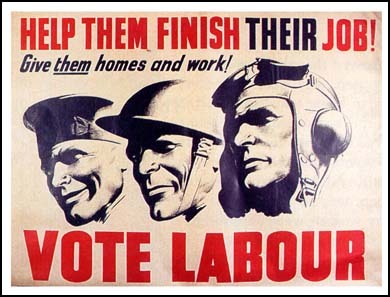 When war broke out in 1939, Labour were quick to support the British ruling class. In fact Attlee’s biggest concern in the early days of September was that Chamberlain, the Tory PM, wouldn't declare war on Germany. Like the First World War, the Second brought increased prices and lowered standards of living to workers. Like in the First, workers didn't just accept this. There were strikes in many industries, most notably in the mines. As Labour and the TUC were partners in the capitalists’ war effort, their response was simple. Strikers were saboteurs and enemies. They must return to work. Everything was to be subordinate to the war effort. Workers must wait till the war was over. Workers on the other hand, according to Herbert Morrison , could only get the benefits of social insurance, ‘by increasing the total national income ... it could only be done by work, thought, drive and initiative.’ (Times, September 6th 1945) . What this meant of course was increased productivity, greater exploitation to screw more surplus value out of the working class - in return for which a few crumbs would be thrown off the bosses table. What was Labour's record on the NHS in this government? They passed a law in 1949 allowing for prescription charges and in 1951 introduced charges on glasses and false teeth. Other notable features of this Labour government were the building of the British atomic bomb and Hydrogen bomb, the rising of the cost of living by 30% and the demand that workers exercise ‘restraint’ and not ask for pay rises. Wartime rationing was kept in place, which ensured that money was spent not on consumption but on investment. This meant not only less for workers, but a drabber, more monotonous existence. In fact between 1947 and 1951 working class people suffered a drop in their real wages. All in all, the great Attlee government gave little to the working class. In this it revealed once again just whose side it was on. This time its membership began more closely to reveal this fact too. In 1945 more than 40 of the Labour MPs were lawyers...... ‘ between 20 and 30 were business men, and a good sprinkling of farmers, accountants, consulting engineers and other professions’ were among the rest. Arthur Greenwood, the Labour Lord Privy Seal, said at the time, ‘I look around among my colleagues, and I see landlords, capitalists and lawyers. We are a cross-section of the national life, and this is something that has never happened before.’ A party originally set up to protect the unions had acquired a constitution written by middle class intellectuals and was now being run by a coalition of union bureaucrats and traditional members of the ruling class. In 1951 there was another General Election. This time Labour lost. It was followed by 13 years of Tory government. The most startling fact about this period is just how similar it was to the previous Labour administration. There was no privatisation. Municipal housing programmes increased in speed. The welfare state thrived. 1964 saw the return of yet another Labour government. Again they came to power on the back of promises to the working class. It would be pointless to give a detailed account of their practice. Some high points, however, deserve mention. This period of government saw an almost continual balance of payments crisis, accompanied by pressure on sterling and the exchange rate. To combat this, Labour put a freeze on wages, but allowed prices to keep on going up. At the same time as freezing wages, they devalued the pound - which of course meant a further falling of wages. As part of their attempt to force austerity on the working class, the government introduced NHS prescription charges and the charge for dental treatment increased by half. They got rid of free school milk in secondary schools, a policy followed up by Margaret Thatcher under the Heath government. New taxes were introduced on imported goods, which made them more expensive for working class people. Even holidays were made less pleasant. Exchange controls were brought in that only allowed people to take £50 with them if they went abroad. Of course the rich soon found ways round this. Once again there was a balance of payments crisis and to this was added the twin problems of unemployment and inflation. True to their past, Labour chose to tackle inflation. They did this with the Social Contract. Pay freezes backed by law had proved very unpopular, and extremely difficult to enforce faced with unofficial and wildcat strikes. Labour’s alternative was a voluntary scheme which relied on the Unions to police their members. In fact the whole Social Contract idea was the scheme of left-wing union leaders, notable Jack Jones of the TGWU. So in the winter of 1975-76, inflation ran into double figures, unemployment rose to unheard of levels and workers were prevented from getting more than £6 a week extra in their pay packets. The success of this policy led to even lower pay rises the following year. Meanwhile, the cabinet secretly agreed to upgrade Britain's nuclear submarine force with the Chevaline missile system. This significantly increased the number of warheads carried on Polaris submarines and improved their accuracy. Since 1979, Labour has been in opposition. This has not prevented it acting in the interests of the ruling class. When the Falklands War started, it was the pacifist leader of the Labour Party, Michael Foot, who gave his whole hearted support for British military action. His speech in Parliament did more to ensure that the task force was sent than anyone else. After Thatcher had finished speaking he stood up to give her his blessing. He said that the Falklands had been,’betrayed and that the responsibility for that betrayal rests with the Government. The Government must prove by deeds that they are not responsible...’ With those words he helped condemn nearly 2000 young men to their deaths. Labour long ago gave up any pretence at wanting to get rid of capitalism. Equally they have got rid of any notion of nationalising large parts of it. Now they claim that they will make it operate more fairly. This is impossible. Capitalism is based on the making of commodities (things to buy and sell) and on the exploitation of labour. When we say this we mean that people who work receive less than they produce, the surplus going to the bosses, whether private or state. Capitalism needs competition to work properly and this means that the bosses must try to keep prices as low as possible. This in turn means they have to get workers to make as much as possible for as little as possible. That is why we are constantly being told to work harder and make more. With increasing regularity capitalism is thrown into crisis by this very competitive drive, millions of workers are thrown out of work and others have their wages or benefits cut. This is the reality of the society we live in. Politicians who try to ignore this are soon brought to account by Stock Market crashes, galloping inflation, flights of currency and capital, currency crises and more. Then they have to return to capitalist normality. This has been the fate for left wing governments the world over, and as we have seen has forced various Labour governments to viciously attack working class living standards. It is this reality which has turned every so-called ‘left’ leader into a ‘traitor’. Ramsay MacDonald and Clement Attlee were members of the ILP. Harold Wilson was a left winger who left Attlee’s government over charges for NHS glasses and dentures Kinnock was a well known left winger in the 1970s and indeed rose to power on the back of his reputation. Left wing Labour councils have been forced to introduce enormous rate bills and Poll Tax bills and when Militant controlled Liverpool they were forced to sack thousands of workers. Groups like the SWP say that they know that Labour is rotten. Yet come every election they demand that we all troop out and dutifully ‘Vote Labour’. They qualify this by saying we should do it ‘without illusions.’ They do this for a number of reasons. One is that despite all their talk, many SWP members and readers of Socialist Worker still do have illusions in Labour. To be open and tell workers not to be conned would risk alienating a lot of support. As the SWP leadership prefer masses of followers to conscious revolutionaries, they have no problem making the choice of saying Vote Labour. Another reason is more sinister. The SWP leadership know what Labour is. However, for all their fine talk, they do not believe that the working class is capable of making a revolution itself. They believe it has to be led to what they call ‘socialism’ by an elite of professional revolutionaries. Part of this process, as they see it, is that the working class has to go through a whole host of ‘experiences’ before it will turn to the SWP for leadership. One of these steps is ‘going through the experience of a Labour government’. They think that this will teach workers that Labour is rotten. They say this time and time again, even though we have experienced Labour in power nationally before and continue to experience it locally today! This attitude reveals the contempt that the SWP and the rest of the left has for working class people and their ability to change society. It also means that they end up as little more than a far left electoral fig leaf for Labour, fostering all the illusions they claim they want to get rid of. Other left wing groups share this view to a greater or lesser extent. Some hold the view that a return of Labour would mean more chance for class struggle. This rests on the illusion that Labour is basically on the side of the workers and anyway ignores the reality that Labour is usually elected at times of rising class struggle - but is elected with the purpose of containing that struggle! But it's a great text, thanks for posting. You scan this as well? If you do scan stuff, could you please put in a short note "scanned by Django for libcom.org in 2009 " or something? Employers value the contribution that union representatives make and go so far as to give them time off work for union activities, provide them with offices, seek their advice and assist their attending union training courses. The influence of the unions on the Labour Party is not as great as it was. But they continue to provide most of Labour"s funds. The old adage holds true, "whoever pays the piper calls the tune." But I think this isn't much of a 'prediction'. Anyway, the person who wrote the article and intro posts on here so they might elaborate. Don't see much wrong with the subbing though. I wrote the text. The bit that Django has highlighted is the section I'm unhappy with. It still embarrasses me that I wrote that. I remain pretty pleased with the remainder of the pamphlet. I suspect that updating it would be sensible and then reprinting it. I can just hear the cries from the left calling for Labour to return to its roots and its socialist principles! I would like Django or one of the others to put a link to the AF-North site at the bottom of the text. yeah, that's our usual etiquette, to put a link to the source at the bottom. Do you have the other Subversion pamphlet on Libcom - Ireland, the Myths Exploded? If not it's on the af-north site. It'd be good to put it around more. I not it's asking alot but is there a chance anyone could provide links to sources so as to convince the more sceptical ones among us, e.g. myself. If anyone is permitted to edit this piece though, I'll give it a crack the week after next - I'm busy at the moment. As I wrote it, I'd be unhappy if it was edited, unless its simply a case of simply sorting out typos. I wrote it 15 years ago, so can't remember the sources, except that read some existing pamphlets. A history of the labour party and a biography of clement attlee plus newspapers in the 80s and 90s. Yeah, I don't think she/he was proposing altering the text - those sort of edits would not be approved by a moderator (instead of that be better to post an entirely new, updated article). But if the edit was adding footnotes, illustrating that they were new footnotes, or hyperlinks to other articles or pamphlets with evidence of the claim that would be acceptable. In fact, we encourage users to edit existing articles to add hyperlinks to other articles on libcom. All in all, the great Attlee government gave little to the working class. House-Building: The Labour government diverted public spending from industry to building houses for citizens made homeless through bombing (55,400 completions in 1946, 139690 in 1947). 1945 Budget: Lifted two and a half million of the poorest people in the UK out of tax. * High taxation the Rich: This was a period throughout Labour's period in office. At its highest level income-tax reached 95.7 pence in the pound. The Free School Milk Act (1946): This legislation guaranteed 1/3 pint free for every school child under 18. This dramatically improved the health of many of Britain's most malnourished children. The government was spending £465 million on subsidies in order to ensure that the cost of food was low for working-people. National Parks and Access to Countryside Act (1949): This was to fulfill a government commitment to provide beautiful spaces and leisure for everyone, not just the landed-classes. * In York in 1936 31% of households lived in poverty. In 1950 the figure was under 3%. Back in the 1950s there was huge state house building programme afetr Harold Macmillan competed to be more socialist than the Labour Party in hitting a higher target than the Attlee Government could manage. A cheering Tory conference agreed in 1950 agreed a target of 300,000 a year. In periods of capitalist slump, it seems that Labour merely tries to follow the same essential policies as the Tories, that is, to refresh capitalism, with all the same attacks on workers' standards of living. So, we all know that workers might benefit from Labour policies during a boom (but, as we have seen, might benefit more due to Tory policies), but what of during the unavoidable slump which follows? Furthermore, Labour governments have always attacked organised workers, boom and slump. Labour governments like all others are openly committed to, and support capitalism in practice. Most aspects of the social democratic programme (carried out by parties of both right and left at certain times) which had benefits to workers were a result of a mixture of capitalist modernising needs and the pressures of class struggle. They do exist but can also be removed in times of economic crisis irrespective of which governments are in power. And of course don't mention the war policies of both Labour and the Tories which were so benefical to workers! - they both worried (unecessarily as it turned out) that they might see a re-run of the post First World War revolutionary upheavals if they didn't deliver some rewards for the long suffering working class. This rests on the illusion that Labour is basically on the side of the workers and anyway ignores the reality that Labour is usually elected at times of rising class struggle - but is elected with the purpose of containing that struggle! Interesting that as class struggle picks up (I mean, we were almost starting from zero...), that we're seeing a resurgence in Labour's popularity. Good post from Spikymike above, too. Not sure why my adding hyperlinks changed the posting date, it was uploaded on 14/12/09. Has anyone read Ralph Miliband's Parliamentary Socialism (1961)? Can I get this in PDF or printed form? is there an updated/edited version? I have just reprinted this with a new brief intro along with a few other pamphlets that will be for sale at the Sheffield Anarchist Bookfair. I have corrected the typo's but have not edited/changed the text. That's great: if there are typos you have corrected could you paste the corrected text into this article so this one is completely correct? Some interesting points in this article but its very out of date and i think anyone wanting to attract people to these ideas would be better off printing off some of the excellent stuff about workfare on this site. whilst its criticism of labour is unstinting it actually accepts quite a lot of 'liberal history books' stuff that i would like to see unpicked a bit more. i also think the lack of nuance in the critique of labour will alienate as many as it appeals to. eg it says the reform act & the corn laws ‘put the old aristocracy class firmly in their place’ - feel this perpetuates a blindness to the persistence of landed wealth, 4000 families own 60% of the land, much of it is hidden in trusts and new banking arrangements, many set up in the few years post 1917. I find the trade union history a bit simplistic though there are some interesting things in there. what’s the evidence that the 1880s ‘new unions’ were under control of craft unions / patrons? not necc disputing but would like to see references. “So the first group of Labour MPs were elected on the coat-tails of the Liberal party as a result of electoral deals and pacts. Small wonder that there was little difference between the two groups.” well perhaps but I think it would be worth engaging with the impact on working class people of seeing working class people like keir hardie in parliament for the first time - even if you conclude this was ultimately unhelpful. “The constitution for the first time allowed individual membership of the party, thus it let in all sorts of guilt ridden, privileged, public school types who hoped to run a reformed capitalism.” well, maybe. but what should it have done instead? and the NHS is dismissed as being about keeping working class people in their place - well, again, maybe, but it is the best loved national institution in the country, and the nearest we have to an institution that fosters collective solidarity and a kind of mutual aid ethos. perhaps engage more with its positive as well as its negative aspect? otherwise this all reads like a bit of an 'accelerationalist', let the working class die untreated from the diseases of capitalism to hasten the revolution, type stuff, that isn't going to appeal to many, i feel. Pretty one-sided article. You have to present the other side so that the reader can make informed conclusions. what a ridiculous comment. If this article purported to give a balanced overview of the pros and cons of the Labour Party, or weigh up its achievements and failures, then you may have a point. But it is called a "critical history" of the Labour Party, i.e. specifically pointing out its negative elements from a working-class perspective.